Picture a seven mile stretch of sparkling white sand. Add an abundance of activities such as hiking, snorkeling, fishing, and shopping. You are imagining Naples of Southwest Florida. Whether travelers are interested in adventure or luxury, the beaches here will not disappoint. Barefoot Beach Preserve County Park is an undeveloped barrier island. The allure of its natural setting, which covers 342 acres, is well protected. Wildlife abounds here. Sea Turtles, tortoises, and a variety of different fish are guaranteed sights. They can sometimes be spotted swimming in the bay by those taking the daily canoe tour. Visitors may also take guided walking tours led by informative Park Rangers. For those who prefer adventure without a guide, boardwalks loom over swamps and trails even lead through the jungle! Hiking is exhausting, so dinner on the mainland at Carrabba's Italian Grill is just what people need to relax and reenergize. Naples Municipal Beach is perfect for simply basking in Florida's tropical weather. Parking is never a hassle, not even near the T-shaped fishing pier, which has been rebuilt three times due to natural damage. This beach is a wonderful place to fish and build sand castles. A nearby snack shop and picnic tables make lunch easy. Dinner, on the other hand, will require a short drive. The Perkins Family Restaurant and Bakery offers fun foods that children are especially fond of. Perhaps jet skiing and upscale shopping sound more intriguing than relaxation. If so, Vanderbilt Beach is the best place to visit. Early birds can begin the day by perusing the beach for seashells. After that, water sports, deep sea fishing, and browsing local stores are wonderful ways to pass time. So is bird-watching; a nearby observation tower at Delnor Wiggins State Park provides an outstanding view of the tree canopy. Gear for snorkeling is even available for rent in this area. A bit farther away is a marina where fish are expecting shrimp to be fed to them by tourists. Speaking of eating, when it's finally time for lunch or dinner, either can be found close by at the Chickee Bar at the Vanderbilt Inn. A trip to Naples can be a romantic couples getaway or an opportunity for family bonding. Some come to explore the jungle, beaches, and diverse wildlife habitat. Others come to splash in the water and soak up the sun. Whatever the itinerary, anyone who visits will treasure the experience for life. In the Third Street South shopping neighborhood, the old Mercantile Building, now an Italian bistro, dates back to 1903, and old, restored Cracker cottages provide charming reminders of days gone by. Near Fifth Avenue South, the Naples Depot, circa 1930, serves as a community center. Naples Fishing Pier - The 1,000-foot pier remains Old Naples' focal point. 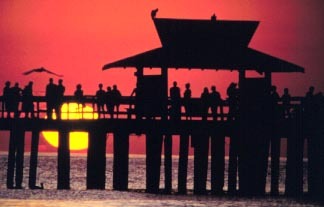 Florida's longest no-fee pier, it is a popular gathering spot for fishermen, strollers, sunset gazers, pelicans and dolphins. Located at the west end of 12th Avenue South; (239) 434-4696. Palm Cottage -- Built in 1895, the simple cottage was one of Naples' earliest buildings and one of the first in Southwest Florida to be constructed of local materials. Furnished with period pieces, it is headquarters for the Naples Historical Society and open for tours. Located near the pier at 137 12th Avenue South; (239) 261-8164. The greater Naples, Florida area is blessed with miles of beautiful, white sand beaches, but this is not your average beach town. Naples is a small yet sophisticated city by the sea, recognized as a leading arts and culture destination with a diverse array of recreational opportunities appealing to all members of the family.. The eclectic combination of shopping, outdoor adventure, boat tours, the arts, dining and fun family activities prompted the Travel Channel to select Naples as its Best All-Around Beach for 2005, and Cond� Nast Traveler magazine selected Naples, Florida as one of the 20 Best Beaches in America 2006.